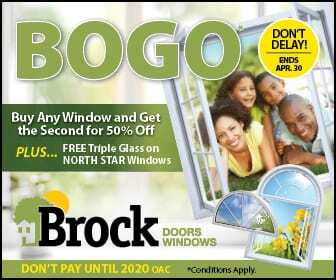 Going Green—Homeowner’s Addition | Brock Doors & Windows Ltd. Brock Doors & Windows Ltd. Going Green—Homeowner’s Addition | Brock Doors & Windows Ltd.
What’s the best floor plan? What Burlington, ON replacement windows are best? These are all good questions. And, the pros here at Brock Doors and Windows Ltd. want to help you answer them. Luckily, they all fall into a “green” category. So, keep reading to learn how to redesign your home to be the most energy efficient it can be. Most wouldn’t think a floor plan has much to do with “going green.” But, it does. Openness usually means natural light reaches more easily throughout the home; thus, less need for flipping on light switches and using more electricity than necessary. Choosing energy efficient windows is a good idea when replacement becomes necessary. If your current windows are showing signs of wear, such as condensation between the glass panes, drafts, or frame warping or rotting, it’s time to replace. Why not choose options that will save you money and decrease your impact on the environment? Look for window options with a reputable installation company that have glass glazing, gas inserts, Low-E glass, and high quality frame materials. Bamboo flooring. This flooring material has become very popular because it’s an easily renewable resource. Woven bamboo flooring. This option is for the homeowner who prefers a more traditional look. It can be stained and is more durable than unaltered bamboo. And, it’s quite affordable. Recycled glass countertops. Other options like granite, quartz, or marble are popular, but this option can actually look similar to granite or stone. Vinyl window frames. These are 100% recyclable and last longer than most other frame options. Proper landscaping. Planting trees and plants strategically to provide shade helps with keeping the home cool during the summer months. In the winter, when the leaves fall, the sunlight will help to keep residents warm indoors. Install programmable thermostats. Preset around your schedule. After all, half of your home’s energy footprint is tied to heating and cooling it. Plus, you won’t have to think about making temperature changes to keep comfortable. This can take off between 3-5% off of your monthly energy bill. Change out to LED bulbs. These use less energy to provide the same amount of light and last at least two to three times as long. The knowledgeable professionals here at Brock Doors and Windows Ltd. can’t wait to help you make your home more earth friendly with our Burlington, ON replacement windows. Our showroom, where you can come and see options, is located at 278 Orenda Road, Brampton, ON, L6T 4X6. Call us at (905) 791-2850 today!